Yes it is. I am making great progress. 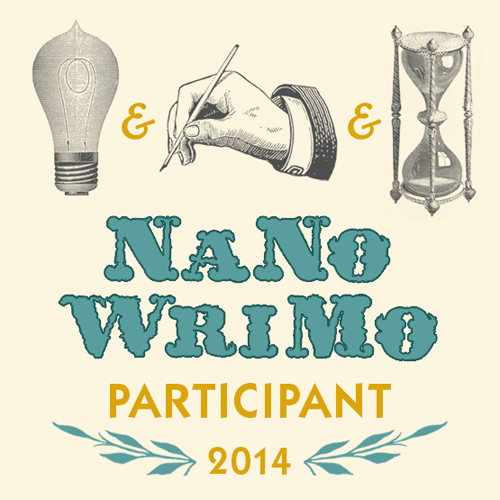 To be honest, the idea of doing NaNo terrified me for years before I ever did it. I just kept saying that there’s no way I could write 50k in 30 days, even if I was willing to let it be drivel (which I wasn’t). I don’t think I got over that until I did the math and realized that it only meant 1667 words per day (that’s every day, but I thought then that I could do it if I kept focused on one day at a time). I think the best gifts I ever got from NaNo are the ones you’re talking about. The inner critic gets left in the dust after a couple of days, and I totally gave up the notion of a perfect (or even great) first draft during my first NaNo. I learned that the most important thing was getting to the end, because only then could I truly understand all the things the beginning had to be and where the middle was leading everyone. Most of all, the pace required forced me to silence that nagging fear that I wouldn’t be good enough and kept me focused where I had to be, on the story. There’s a reason I do every first draft NaNo style since my first outing with the event. It’s the only way I get to the end, the only way I have something to edit that’s worth the time to do it. The relentless push forward has pushed me forward in a much broader sense. I guess all of this is my way of saying that I’m so glad to see it working out for you. I’m glad you’re reconnecting with writing. I’m glad you’re learning from it. Isn’t it amazing what can happen when we ignore fear and try anyway? This is exactly how I feel! I am a little overwhelmed at times but it is the best thing for my story.